When it comes to running a business successfully, it is always a good idea to keep an eye on your competitors’ Facebook activities and gauge whether or not their ads are bringing them success. After all, conducting competitive analysis is a big part of taking your business to greater heights. Fortunately, it has become easy to view and track what they are up to, take notes from their success for creating profitable Facebook ads for your offerings, and even reach their customers. While Facebook does come with an in-built Info and Ads tool, here are a few other ones that will allow you to track the success of your competitors’ Facebook ads and promotion strategies. AdEspresso is an effective Facebook ads spy tool in that it allows you to access its vast library consisting of over 1.5 million Facebook and Twitter ads. Users can use its Ad Gallery to learn about the activities of their competitors, thereby gaining inspiration to devise their own ads. You will be exposed to ads from over 25 industries. This tool allows users to view images of each ad, along with the headline, text content, and the post link. You can also view other ads from the same competitor. Moreover, AdEspresso shows you the engagement rates for all ads. You can easily filter the Facebook ads according to the information you need, like platform, placement, objective, industry, and attribute. AdPlexity allows users to not only monitor competitor ads, but also download promo materials like landing pages and banners from most of the well-known ad networks from over 70 countries. It is considered one of the best desktop and mobile ads spying tool that enables business owners to make informed advertising decisions by gauging other successful ads. This tool provides users with superfast search results and offers real-time insights on campaigns running on pop-under ads. It is used to detect hidden campaigns running on mobile carrier traffic from around the world. With over 100 affiliate networks, it also supports all major device platforms such as Windows, Mac, Android, and iOS. Social Ad Scout allows users to identify and access thousands of social ads from as many as 21 countries. Users can employ advanced filters to search by types of ads, device, URLs, demography, location, and more. The results display details such as how often the ad is viewed, who has viewed it, which device it was viewed on, how it ranks, and so on. As an effective ad spy tool, Social Ad Scout enables users to get screenshots of ads. You can also download the landing pages easily. Moreover, this tool allows you to work with desktop as well as mobile ads while covering every platform. Search results are displayed in seconds and the overall user interface is impressive. SocialPeta enables users to conduct an in-depth analysis of marketing data from mobile advertisements from all over the world. It uses big data analytics to help you arrive at smarter decisions based on creatives from millions of videos, images, search ads, and more. It captures and tracks information about trending apps, new releases, new marketing cases, as well as their ads and their performance by country. You can view data of about 500,000 apps across various social media channels. It is compatible with almost all platforms and helps users formulate the best advertising strategies, which in turn, boosts ROI. PowerAdSpy provides Shopify ads search and offers one of the largest ad indexes with over six million ads available from more than 15 countries. It, therefore, becomes easy for users to discover several ad variants within a few seconds. Additionally, users can visit the live Facebook ads directly from PowerAdSpy’s dashboard. You can also put this tool’s intuitive layout to good use by creating as well as unearthing winning ads for social campaigns. This tool allows users to follow an unlimited number of competitors and view details about their target audience’s interests, age, and location. You will also be able to see every ad along with its landing page. Further, PowerAdSpy will enable you to view all the social interactions related to the ads so you can determine which ads actually clicked with the audience. AdSova enables users to spy on competitors’ ads and discover the highest converting ads, banners and other media, which is why it is great for visual advertising. It boasts of a huge database of over 500,000 text and visual ads so users can easily understand which ads work and which don’t, thereby saving time and boosting ROI. Further, it adds more than 2,500 ads daily to its growing database. Users can search for ads and the results are presented in a matter of seconds. Also, AdSova is extremely easy to navigate, thanks to its user-friendly interface. 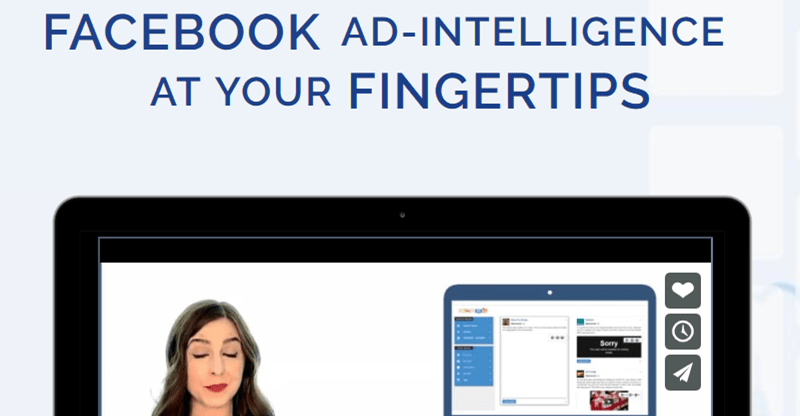 All in all, with AdSova, you have an easy-to-use, feature-packed Facebook ads spy tool that comes at an affordable price. ConnectExplore comes with an automated SMART Research Tool that “uncovers interests your competition will never find.” It allows users to target the most engaged interests on Facebook, enabling you to determine which interests are clicking with the audience. It is also equipped with built-in “layering” that enables users to target the most engaged fans in any niche. Users can also optimize ad results with the help of comprehensive interest performance statistics, without performing split testing. With ConnectExplore, users can discover, filter, target, and analyze and scale the best interests. You can add interests directly to your ad set. This tool helps save time as it displays quick and detailed results, thereby showing campaigns that work and maximize ROI. AdSpy enables users to search through its massive database covering 195 countries for all kinds of desktop and mobile ads. It has over 67,590,000 ads, a number which grows daily. Users can find some of the best social media ads and funnels at lightning speed. Because it is Web-based, you need not worry about problems related to compatibility. Thanks to AdSpy’s intuitive design, using it is as simple as logging in and searching. With AdSpy, you can figure out your competitors’ target audience, engagement rate, ad copies, images, and more. With all this data at your disposal, you can design campaigns that will help your business enhance its ROI. You can search for ads by keywords, affiliate network and ID, and landing page, among others. PayPerTrail enables users to uncover the most lucrative ads and all the high-performing websites, allowing you to determine network placements for your upcoming campaigns. You can view ads from over 60 display and native networks and expand your research globally in 18 countries. The tool adds new data to its existing database regularly. This tool helps users grow their network by letting them view new publishers and pinpoint high-value advertisers for future collaborations. It also enables you to understand the monetization and audience-building strategies of competing publishers so you can formulate your own effective traffic monetization plan. Further, its alerts and advanced bookmarking system help you find gainful campaigns with ease. With WhatRunsWhere, users can mine in-depth and the latest details related to the creative strategies used by competitors in their best-performing campaigns, along with the calls-to-action that are working for them. This helps you enhance your CTR and design better campaigns for your business. As a competent Facebook ads spying tool, WhatRunsWhere helps you find new sources of traffic so you can reach larger audiences, comprehend critical trends across desktop, mobile and native channels, and receive insightful data from 5 of the biggest online markets. This tool ensures that your advertising strategies continue to perform even in a frequently changing environment. Monitoring your competitors’ moves on social networks is always a good business strategy that helps you avoid complacency and doubts. The above ten tools will help your business stay ahead in the race for the top spot. All you need to do is pick one that suits your requirements. Which tool have you been using so far to track your competitors’ social media activities? Do let us know in the comments section.